Since I continue to see a surprising number of people visiting this blog thanks to having googled after info on MEC here in my home town, I feel that an update is warranted. 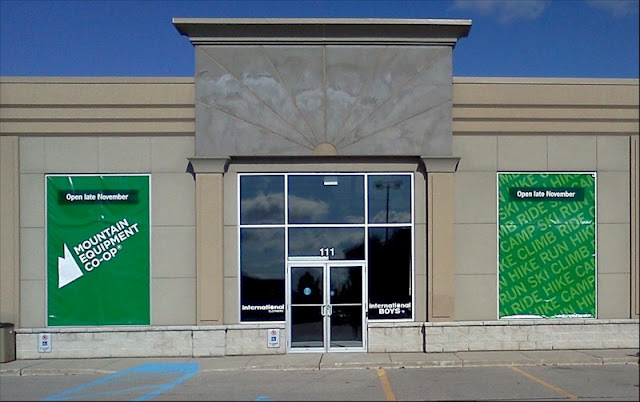 I've been swinging by the as of yet unopened Mountain Equipment Co-op store here in London Ontario once in a while to see what, if anything, was up. After several weeks during which all was quiet on the MEC front (storefront, that is), there are now signs of life. Very green window coverings are proclaiming that the store will open in Late November. Knowing how such things sometimes go, I'm not holding my breath. As you can see, there's some signage and they've plastered over the scars from the previous store's signs up top. Those green things have been there for at least a week, but this time when I swung by, there were contractors on-site. I stopped short of taking their picture through the window because I figured they might find that a little weird, haul me inside and question me under the glare of a trouble lamp and with threat of nail gun. Maybe I should have though, because if they chose to speak to me I could have at least thanked them for removing that ominous demising wall. For every single scrap of London MEC info or oddness that I have posted so far, click here.